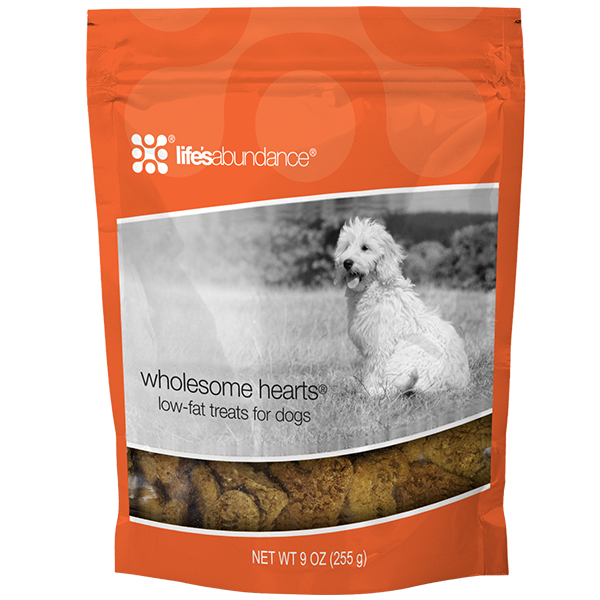 Wholesome Hearts are delicious, low-fat dog treats. 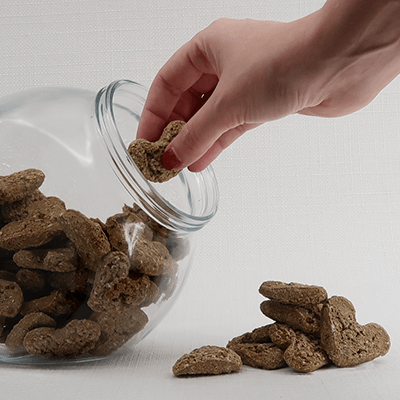 They are perfect for dogs that could stand to shed a few pounds and the rich flavor and delicate aromatic spices make them simply irresistible. Proudly made in the USA with high-quality American ingredients. No corn, wheat or soy and their glutens. No artificial colors and no artificial flavors. Fortified with L-Carnitine to help the body utilize fat. Contains multi-grains, fruits and vegetables. With chicken meal, eggs and other wholesome ingredients. Gently baked, heart-shaped treats with a “just from the oven” flavor. 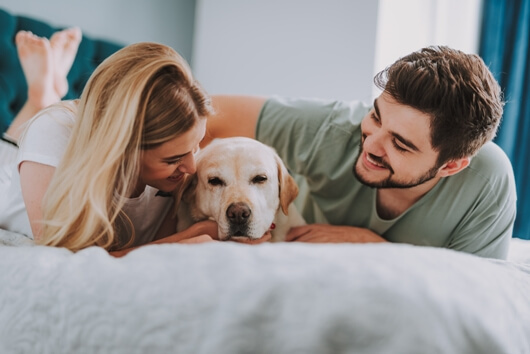 “Whether your dog is experiencing a problem with weight, or if you just want to help your pup maintain a trim and healthy figure, you can’t do better than the nutrition of Wholesome Hearts. I highly recommend Wholesome Hearts because they are healthy low-fat treats that will satisfy your dog’s desire for a tasty snack in-between meals.” - Dr. Jane Bicks, DVM. Each 9 oz. bag contains approximately 38 treats and each 18 oz. bag contains approximately 76 treats. Calorie Content (calculated): Metabolizable Energy (ME) = 3,420 kcal/kg, 25 Calories (kcals) per treat. Feed to your dog as a reward for good behavior or as a delicious, healthy snack just because you love them. great alternative to commercial treats. Our dear dog Charlie has a way of outwitting us and getting more food than he needs. 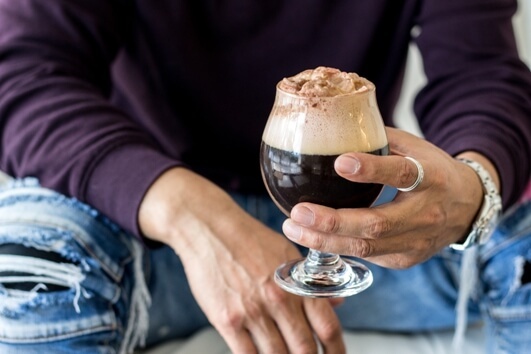 Knowing that these are low-cal and heart-healthy treats makes them an ideal way to deal with his constant food obsession. These smell so good I could eat them! My goldens think these are super yummy! I like the fact that they are low-fat and they contain healthy nutrition. They smell like oatmeal cookies! Ok we aren't a puppy anymore, lower fat plus heart health, and still yummy was a great idea. Any LA treat is welcomed by our dogs or my pet nanny clients. Very tasty, no complaints. 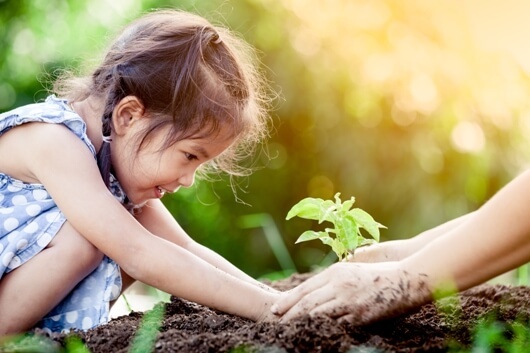 fantastic for reinforcing the adults good behaviors. Great treats for dogs , good for them and they love them! My new rescue dog, Bella, just loves the Wholesome Heart treats. I know that she's getting a high quality product with no extra "stuff" thrown in. Our Standard poodle loves these . Great for road trips. My dogs will do tricks for these. My dog gets excited when I get out the bag of these treats. Since she's older, she's not as active as she once was, and these treats are perfect since they are low fat. Easy to break in half for those special treat-times! Smell great and doesn't crumble. My dogs love these treats and I like the fact they are low fat. They smell so good! My dogs go crazy as soon as I open the bag. Healthy treats that my dogs love! Wholesome hearts because I love my dogs! Two paws up! I love the smell of wholesome hearts and the fact that they are great for dogs that are watching their waist line. Tasty and wholesome. What could be better? Another great treat highly recommend. Another great produce. They smell so good, I actually tried a piece and was very surprised on how good they taste. It is no wonder Tara is always looking for one. All 6 rescue dogs love, love, love this treat!! These are so good and smell like a ginger snap. Great high quality treat! My pups and my neighbors pups all love these!! All treats are loved by my dog. I trade them off every day. He is small so I do break t hem in half and they break in half easily. Could be smaller treat size. Great, crunchy treat that my poodles absolutely love! I feel so good giving Ziggy these treats! These wholesome hearts smell good enough for human consumption! I certainly get tempted when we run out of human snacks. Low in fat, harder snacks are good for their teeth and our dogs lover them. This is probably my dogs least favorite. I love the smell. She will eat them when she doesn't have an alternative. My dogs love all of the Life's Abundance food and treats. And I love that the products are good for my dogs, not filled with a bunch of junk that my pets should not be eating anyway. I highly recommend all of the Life's Abundance products. Another good crunchy treat that smells and tastes good, especially for the dog who needs to lose a few pounds. A great treat if you are trying to "watch" your pet's weight! Nice treat that all the dogs love!